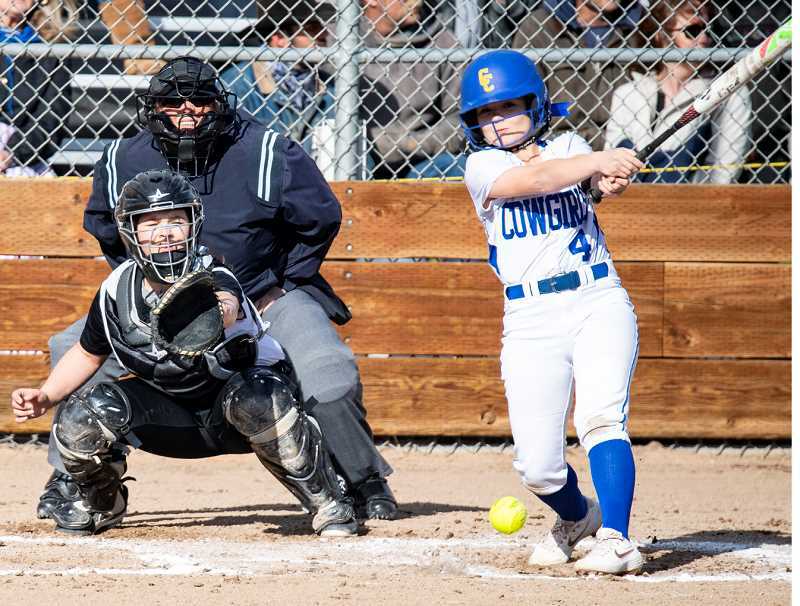 In their final pre-league game of the year, the Crook County Cowgirls rolled to an 18-4 victory over the Sisters Outlaws Tuesday afternoon in Prineville. "I wouldn't say that it was easy," Crook County catcher Caitlyn Elliott said of the win. "I would just say we were more prepared. Every game is a step closer to being ready for league." In a game where the score could have been even worse, the Cowgirls did what they needed to take control, then made some substitutions down the stretch that led to a handful of late Outlaw runs. "The focus this week is on the little things," Crook County head coach Jeremy Puckett said. "Little things like our base running, getting our signs, working on throwing and catching. Just doing the little things correctly. Today, we made five or six mental mistakes that we can't make going forward." After holding the Outlaws scoreless in the top of the first inning, Crook County exploded for 10 runs in the bottom half of the frame to take control of the game. The Cowgirls sent 13 batters to the plate in the inning and had scored five runs before the Outlaws were able to get their first out of the game. The Outlaws got their first base runner of the game in the second inning but were unable to score as starting pitcher Emma Lees struck out a batter, then forced the Outlaw batters into easy outs as the base runner never got past first base. After the Cowgirls failed to score in the bottom half of the inning, the Outlaws went down in order in the third before Crook County scored four more runs on just one hit, a single by Ashley Owens. Crook County did the rest of the damage, by taking advantage of walks, aggressive base running, and Sisters errors. Sisters got their first run of the game in the top of the fourth inning off of a walk, a wild pitch, and a single to left. However, Crook County answered with four more runs in the bottom half of the inning to run the score to 18-1. The big hit of the inning was a double by Berkley Puckett, her second of the game. Kalyn Martinez came in to relieve Lees in the fifth as the Cowgirls shuffled their defense. Martinez struck out the only batter she faced before Liz Barker took her turn in the pitching circle. It was Barker's first time in the pitching circle in a game, and she struggled with control. "Liz has been working through the winter and through the spring," Puckett said. "She has been working and working, and we have never gotten an opportunity to throw her in a game." Barker showed that she can throw hard but struggled with control, walking several batters as well as hitting the final three batters she faced. The Outlaws scored three runs and had the bases loaded still with only one out, when Sisters head coach Desmond Boots decided to end the game. First, Boots had his runner on third base leave the bag before the pitch, an automatic out. Then on the next pitch, he signaled to the runners on first and second to do the same thing. Although the Outlaws were down to their last out, both runners were called out on the play. "From his words, it sounded like he thought we were hitting his players intentionally," Puckett said of Boots' decision. "What he doesn't know is how hard Liz has been working." In spite of all the runs, the Cowgirls did not hit the ball as well as could be expected, managing just seven hits in the contest. Puckett led the team at the plate, going 2-for-2 with a pair of doubles and four RBIs. No other Cowgirl had more than one hit in the contest. With the victory, the Cowgirls improved to 7-4 on the year, while the Outlaws fell to 1-8. Sisters has now lost five games in a row, while the Cowgirls have won five of their last six games. The winning streak could not come at a better time as Crook County has a daunting task ahead in the Intermountain Conference season. 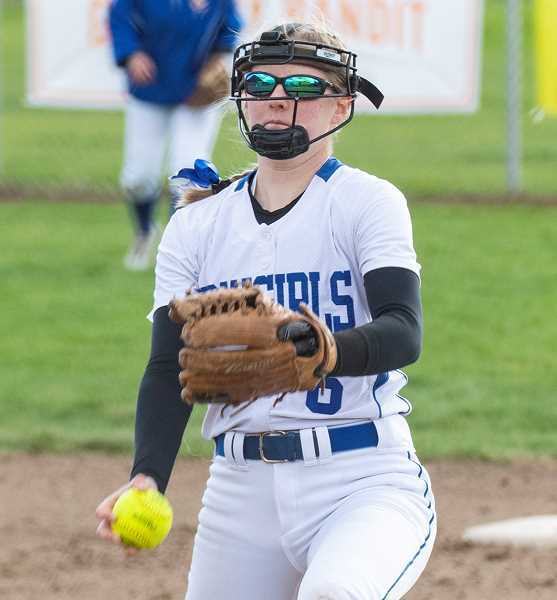 The Cowgirls open league play on Saturday with a double header against the defending state champion and sixth-ranked Pendleton Buckaroos, who enter the game with a 7-3 record. The IMC is shaping up to be one tough league, with every team in the league ranked in the top 20 in the state. Perhaps even more daunting, four league rivals are ranked in the top 10. Ridgeview is currently undefeated and ranked first in the state, while Hood River Valley is 8-2 and ranked second. The Dalles is also in the top 10, sitting in eighth place with a 6-2 record. Even Redmond with a 6-4 record is ranked ahead of the Cowgirls, with a power ranking of 14th, while Crook County has moved up to 18th. "We are going into a real tough league, so we will see how it goes," Elliott said. "We are going in with the attitude that we want to win and that's how we are going to play it." Puckett agreed that the league is extremely tough but said that he believes that Crook County can compete well, provided they can play error free. "Today we made some base running errors, like knowing there are two outs and not running," Puckett said. "Knowing that on a dropped third strike you run to first base. All those little things really matter from here on, but if we can play great defense, I think we can hang with them. Our league is incredibly tough, but I'm excited for the girls and to see how they match up. It will be good and it could be eye-opening." Saturday's home doubleheader is scheduled to begin at noon, with game two starting at approximately 2 p.m.